This 2010 Gregory Benedetti design is effectively two puzzles in one: the boards and sticks combine to form a level 9 burr, and if you build the same burr inside the confines of the frame, it rises to a level 12 burr in a frame. 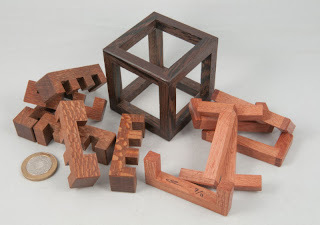 Eric Fuller made a run of these puzzles about a year ago and I was a bit slow off the mark and didn’t manage to pick one up when they were first offered. 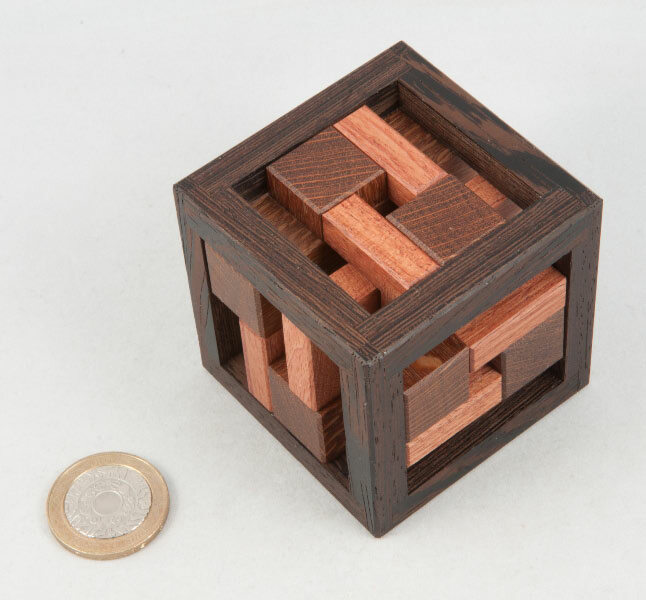 Fortunately for me, one of my puzzle-buddies was quicker off the mark than I was and a couple of weeks ago he was thinning out his collection in favour of some new glass for his other hobby, so I took it off his hands. It’s an interesting design given that there are two shapes of pieces (boards and sticks!) and there are six identical copies of each, with the sticks made of Leopardwood and the boards made of Bubinga – they fit inside the Wenge frame that Eric has taken a lot of trouble to reinforce – making for a nice, sturdy frame that you won’t be afraid you’ll break. All of the joints on the boards are shouldered as well. As usual, one of the pieces has Eric’s signature and the date on it. As you might expect from a level 12 burr, disassembly is decidedly non-trivial and the first time I took it apart I managed to ties myself in all sorts of weird and wonderful knots with bits hanging out all over the place before I finally managed to extract my first piece – and it didn’t exactly get much easier from there on either... the extra space in the frame after the first piece is removed seems to vanish and things don’t really get any easier until the next piece or two are removed ... then things loosen up a bit and it’s plain sailing to the end. Reassembly is something else altogether – the ‘boards’ aren’t really boards at all – more like wide, spindly u-shaped pieces and they are wont to twist and swivel when you’re trying to get things neatly aligned during the assembly process. Things tighten up a bit as you get more and more pieces loaded into the frame until they’re pretty much forced into the right orientation – and then, bizarrely, it actually feels that working in the confines of the frame makes the assembly feel ‘easier’ – at least in the sense that everything is being held in place by the frame – of course you’re having also having to work inside the confines of the frame which makes things a little fiddlier... outside the frame, there's a killer step in the middle of the assembly where you end up trying to mate two halves while keeping everything lined up properly - remember those fine tolerances?! Lovely little puzzle – in the classic Eric Fuller-style of lovely wood at an enjoyable size – tolerances are perfect and it’s an absolute joy to play around with. I'm impressed Allard! I got mine when they first were released and have still not managed to open it! I keep going around in circles. I think I'd better try again soon! This is one of my favourite puzzles Eric's made. It took me 4/5 hrs to assemble in and out of the cage. As a level 12 it's not that hard but the cage makes it a much better puzzle.